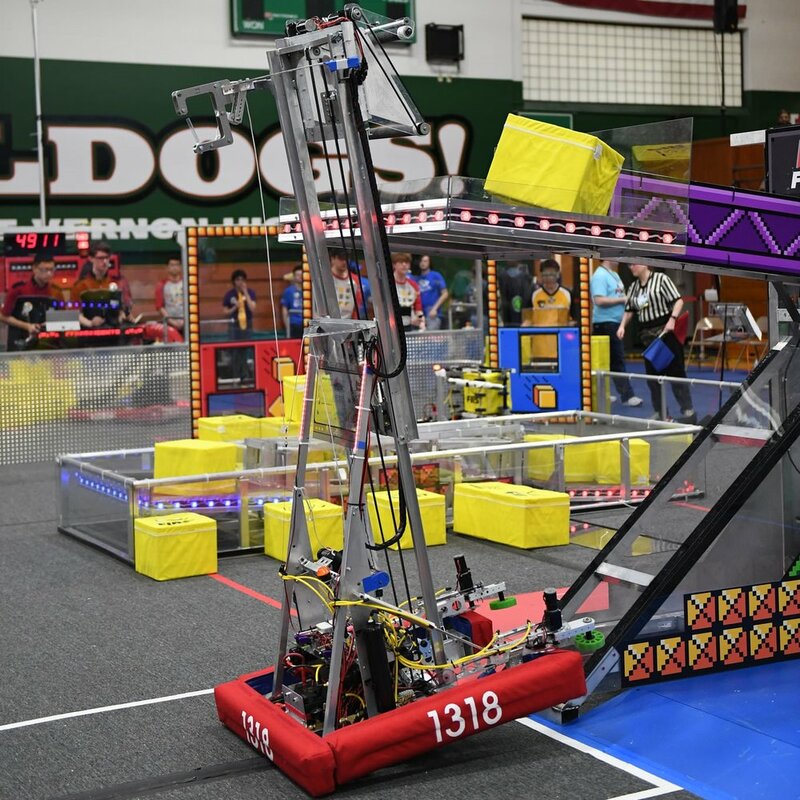 FIRST Power Up is the 2018 FRC game. It involves two alliances of three teams each, with each team controlling a robot and performing specific tasks on a field to score points. The game has a retro 8-bit theme and teams are required to place milk crates, or "power cubes", on large balancing scales to tip the scale and gain ownership. Alliances can also trade power cubes for power ups, giving them a temporary advantage in a match. At the end of the match, robots can climb the tower attached to the center balancing scale using a rung attached to the tower, giving them additional points. Outer vertical-axis rollers tilted slightly on two-segment pneumacally actuated arms. The tilt provides lifting action to improve intake to second set of rollers. This part of the system stays with the base. Inner horizontal rollers capable of picking up cubes in any orientation, including the "diamond" (diagonal) orientation. This part of the system moves with the elevator. Custom two-way clutch mechanism integrated into a Vex Planetary gearbox stage to hold the elevator in position when the motor is not running. Custom adapter plates for the center wheels of the drivetrain allows the kitbot to be used with Colson wheels instead of the standard HiGrip wheels.